Friends, your many actions, contributions, petitions, votes, and phone calls/emails to your reps in congress have made a difference for wildlife in more ways than you may even know…here is what your blood, sweat and tears helped us accomplish this year! Facilitated meetings with Senator Tammy Duckworth’s office for veterans and scientists. Facilitated meetings with Senator Tammy Baldwin’s office for over 30 allied voices. Met with Senator Joe Donnelly’s office with another constituent in South Bend, Indiana. Met with Congresswoman Debbie Dingell’s staff in Lansing, Michigan. Met with Senator Debbie Stabenow’s office in Lansing, Michigan. Met with wolf and Endangered Species Act (ESA) champions including: Congressman Mark Pocan and Congresswoman Gwen Moore in Wisconsin, and Congresswoman Betty McCollum in Minnesota. Through these initiatives, we helped stop over 75 attacks on the Endangered Species Act, Omnibus bill, wolf delisting bills, Farm Bill, NDAA bill, and local and state anti-wildlife bills including pro-hounding and pro-wolf poaching bills. We organized citizens to persuade legislators that wildlife belongs to everyone and that keystone species, like wolves, need special consideration and protections. We brought together wildlife watchers and advocates, ethical hunters, non-consumptive users, scientists, silent sports enthusiasts, farmers and tribal members for wildlife as a unified voice for policy. We partnered with the Endangered Species Coalition and the Native Plant Conservation Campaign to generate voter registrations online. We sent out several alerts to our members, recruited wildlife advocates to sign the pledge, encouraged members to register to vote, update their registrations, help others register to vote, and provided tools to help participants become prepared and educated voters. We invited everyone to come support local, indigenous and professional wildlife photographers and artists and learn more about how they could help keep protections in place for imperiled and endangered species around the US. The show featured rare and vanishing species, wildlife photography and illustrations by professional, local and indigenous artists, and aimed to educate the public about keeping protections in place for imperiled and endangered species in the Great Lakes region. Entertainment included speaker Bill Greendeer from the Ho-Chunk nation, film showings from Project Coyote and Friends of the Wisconsin Wolf & Wildlife, and special musical guests. 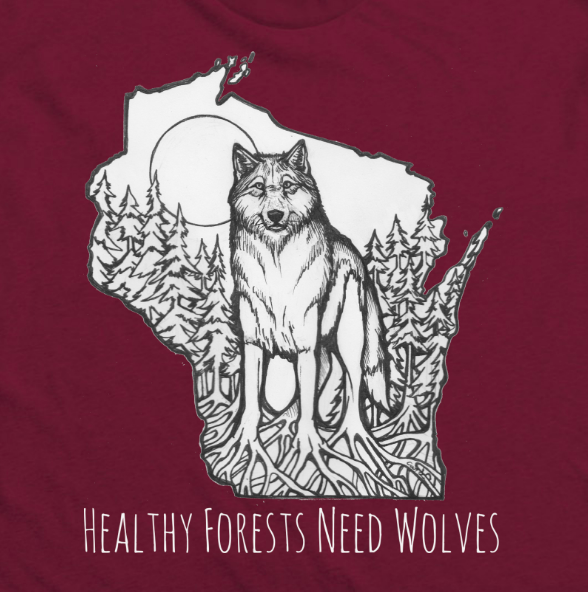 Despite the often-discouraging news, we pledge to never stop fighting for the future of wolves and wildlife in Wisconsin and the Great Lakes region. For the new year, we are staying optimistic thanks to active and devoted supporters like you. From the bottom of our hearts, HOWLS OF THANKS for your continued and unwavering support.